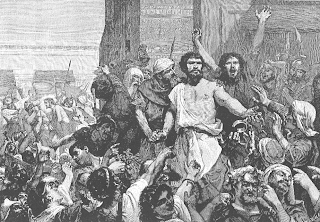 The picture of this angry mob demanding Jesus’ death brings to mind mobs I have seen (mostly via TV and the safety of my living room). 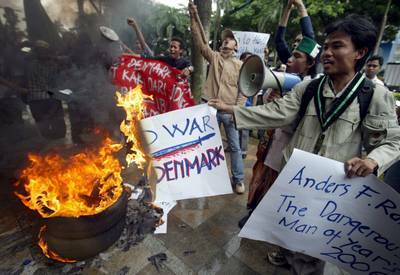 - Muslim demonstrations after the publication of the Danish cartoons. - Mobs on the streets of Kiev during the Orange Revolution movement in Ukraine. - Partisan fans at soccer games in Britain and Europe. 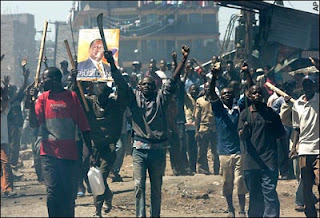 - Bloodthirsty crowds during wars of genocide in Rwanda and Kenya. - Most lately the multitudes on the streets of Vancouver during the 2010 Olympics, cheering on Canadian athletes. While being a part of these mobs can be fun and non-threatening (as in the last one), I can imagine feeling only terror should one be on the opposite side of the will of most mobs. Mob psychology is unpredictable but often results in actions of apparent insanity that would never happen during moments of cooler emotion. Before we are too hard on the disciples for never raising a hand to defend Jesus but running away, we should put ourselves in their places. Would we have done any different? I see this angry mob during the events of Jesus’ passion as another ploy of Satan. He would use every trick in the book. Frenzied voices raised in unison against Jesus suited him just fine. PRAYER: Dear God, it is easy for me to become intimidated by a multitude of voices. In such times, please remind me that You are Lord, even of the mob. Amen. "It is no fun to be in a room where everyone assumes a particular view and you do not hold it. Only the very brave, the very wise, or fools rush to expose their minority opinions. Few of us are brave or wise and fools simply confirm the stereotypes. The rest of the very religious keep quiet and so nobody learns. " - John Mark Reynolds, Professor of Philosophy & Director of the Torrey Honors Institute, Biola University.